In the early 1800's land was begging to be homesteaded and adventurers in Tennessee, Kentucky, Georgia and the Carolinas were heading for Arkansas. John Tabor and the Magness families were already here. Mr. Tabor had plans to marry Betsy Magness; her family objected but love won out! They married and moved to a home he established on Fallen Ash Creek and he proceeded to plant a fruit orchard -- the first in this area. Thomas J. Flippin succumbed to the urge to find new land and in 1820 he and several members of the Flippin family left Hopkins County, Kentucky, bound for Arkansas. It took several months to make the trip but in 1821 they settled near where the Marion County Airport is now located. As time passed, a town of sorts grew; there was a general store, flour mill and a cotton gin. A traveling salesman called the place Goatville, but the residents of the growing community thought it should be called Flippin Barrens (there were very few trees) to honor the early settler. The years following brought the families of: Pangle, McBee, McCracken, Huddleston, Alford, Wood, Marberry, Williams, Noe, Osborn, Barnett, Mears, Keeter, Fee, Musicks, Sanders and others, mostly from the southern states. Flippin Barrens barely lived into the 20th century for in 1904 the railroad came through fields almost a mile from the town. Mr. Lee Hayes soon moved his store from the old town to the railroad site and soon other businesses were established and the new Flippin came into existence. Marion County Town Company was a corporation which bought 20 acres and platted streets and lots. They probably did not make a lot of money on the venture before going out of business; a few years later they held an auction and sold the remaining lots. Mr. F. G. Huddleston established a general store; other early businessmen were Johnson brothers (Levi and Eugene), Walter Wooten, John Talburt and Jack Pickett, most of whom were merchants. A well was drilled in the middle of Main Street, equipped with a hand pump. It supplied many homes and businesses with water. The office which the representative of Marion County Land Company operated was located on the north side of Main Street between Second and Third Streets. This office later burned. Flippin had a creek running through town and swinging foot-bridges were built so people could cross the creek to and from town. Streets were graveled and not very wide. The first black-topping was done on U. S. Highway 62 by the state in 1939. The coming of the railroad naturally had an effect on the community and new businesses continued to spring up. Mr. Nolan Carroll, already in the lumber business, built and operated a general store north of the railroad between Main and Girard Streets. A cafe was operated by Mrs. Trimble, later operated by Mr. and Mrs. Fernamen, Emery Estes and Walter Moore, by V. M. Phillips and by Mary Razor. There was a place to sell poultry, eggs and produce, operated by Fonce Hall. The Telephone Company was owned and operated by J. K. Rea and family. There was a bank exchange operated by Joe and Winifred McCracken; later there was the Citizens Bank which went broke in the early days of the depression (no connection to the present Citizens Bank of Flippin). Until the early 1920's the place of worship was the Union Church located where the First Baptist Church now stands. It was just what the name implies -- a union of all denominations, used by the denomination that had a preacher. The Assembly of God and the Christian Churches were built in the 1920's; the Baptist continued in the Union Building until the early 1940's. The Church of Christ and the Church of God have since built and established churches. At one time there were three active fraternal organizations: Woodmen of the World, Odd Fellows and the Masons. They also met in the Union Building. Mr. Elliot Daffron operated a hotel at Girard and Second Street. Passengers from the daily passenger trains could see the sign offering hotel accommodations. Later Mr. I. P. Rose (Doc) bought the hotel and he and his family operated it many years. The town had a doctor but no dentist or optometrist, so Dr. Palenski, a dentist, and Dr. Brown, an eye specialist, made regular trips to Flippin by train and set up temporary offices in the hotel. There was a livery barn operated by a Mr. McSpane and a Mr. Morgan. Blacksmith shops were doing a good business. Mr. Warren had a shop on Park Street. Al Guinn, Cole Duggins, Tom Phillips and Emery Estes were also the town blacksmiths during those early years. Cars began to appear a-nd Cleto Parnell opened a service station and repair shop. Tony Sullivan operated a garage between Second and Third on Main Street. Mrs. Belle Tucker had a small novelty shop on Main between Third and Fourth Streets. She had many little novelties that could be bought for one or two cents. The Real Art Theatre was operated by V. M. Phillips and, at one time in the 1920's, Jack Merrill had a clothing store in this block. Dr. F. G. Huddleston, Dr. M. D. Matthews, Dr. J. T. Matthews, and Dr. Ben Denton were early doctors for the Flippin area. Self-reliance and pride were not short among the early residents. Their cooperation, neighborliness and helpfulness was shown by their concern for a sick friend. Mr. Silas McBee, a farmer in the "bend" as the area northeast was known, had been to Little Rock for surgery: he came back to Flippin by, train but was too ill to make the five-mile trip home by wagon. Mr. and Mrs. Tobe Keeter (Mr. Keeter was the depot agent) took him to their home nearby. Naturally, he wanted to be with his family, so a group of friends prepared a stretcher, placed him on it, and four men carrying their friend set out for his home. When they became too tired to carry him further, four more men would take their places and, thus, they carried the terminally ill man home to his family. By 1921 the community was flexing its muscles and a group of business men set about the task of getting the town incorporated. The necessary work was done in June 1921 and the Secretary of State signed the order of incorporation. James M. Keeter became the first mayor but the names of the first aldermen are unknown. In January 1925 the whole area reeled from the loss of their hero -- the family, doctor, Dr. Pat Keeter. The young doctor pushed himself too far and too hard, trying to care for all the ill who depended on him and pneumonia claimed his life. Soon a young doctor from India came and began practicing. People were close-knit and suspicious and the story is that he was run out of town. In 1926 Dr. A. H. Pyrtle came to Flippin. He made house calls, knew all the family and kinfolks, and served the community. School for Flippin children was about one-half north of what is now, Highway No. 178. Buses, lunchrooms and hot lunches were unheard and completely unknown. Row crops were a way of life and two cotton gins ran full-blast in the autumn. This provided a few men with jobs of operating the gins. One was known as the "Farmers Gin". It was a cooperative of farmers and merchant stockholders; the other was operated by Seth Hurst. A canning factory was in operation just west of Girard Street. Later Seth Hurst operated the Hurst Canning Plant, his specialty was tomatoes. Some farmers made extra money raising tomatoes for the plant and local women who wanted an outside job other than farm work looked forward to working at the canning factory. E. C. McBee was postmaster and the post office was at the end of West Main Street, near the present residence of Glenn Johnson. Later, the post office was in a part of the "Golden Rule" store and was operated by D. M. Lee. The building was on the north side of Main Street between what is now Ozark Realty and the office of Attorney Dale Shoup. When the Golden Rule store went out of business, Joe McCracken and E. L. Huddleston (Joe and Hudd) operated a general store there for many years. Parnell's store on the south side of Main Street carried a good line Of Peters Red Goose shoes and the children always got a whistle or popper if they behaved nicely while getting shoes. Walter Wooton continued in the merchantile business for several years, though he had various locations. A store operated by J. N. (Daddy) Griffin handled everything from candy to coffins. For those who could not afford to buy the ready-made caskets, there was the service of Carl Flippin, who made most of the caskets. There were a few other local carpenters who made caskets, also. The burial clothes were usually made by Nellie Pangle (later Mrs. Carl Flippin). She was a good seamstress and it was not unusual to send for Nellie to make the burial clothing and for Carl to make the coffin. Graves were always opened and closed by friends -- there was no grumbling about not having time when a neighbor was in need. At this time Flippin had lots of good timber and stave mills offered employment for men looking for work, cutting staves for whiskey barrels or cutting the bolts to make staves. The whole country was trying to cope with a depression in the 1930's and Flippin was suffering, too. Growth was slow in those years. Early 1940's stripped the town of able-bodied young men. Those not in the service went to the cities for employment and to help in the war effort. Hearts ached in Flippin, as in every other town, for those servicemen injured and killed in the great war. James Clark, Burl and Glen McCracken (brothers), Donald Padgett and Claude Garrigus were among those from the Flippin area who gave their lives. 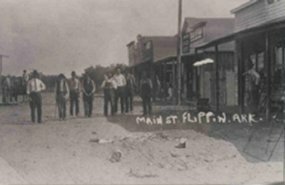 During the 1930's and 1940's Flippin had a Drug and Sundries Store operated by P. C. Callison, who succeeded Gus and Elbert Butler. There was no pharmacist and the doctor carried his medicine with him to mix when needed. At the Callison's Store groceries, patent medicine, clothing and a good, five-cent ice cream cone could be purchased. Main Street merchants during those years included: W. E. Rose, Grundy Huddleston, Doll Treat, Cal Cornell and Son, L. 0. Sanders and Son, P. W. Huddleston, Nancy J. Daffron's Cafe, Arleigh and Irene McCracken's Cafe, Wood Garage, C & J (Carroll and Johnson) Lumber Company, and A. M. Seawright's Grocery, gas station and first tourist court in Flippin. M. G. Stookey and W. N. Christian operated a store on Main Street for many years and, after their retirement, it was owned and operated by Verlis Rose. H. F. Wood, better known as "Squire", was a familiar figure in and around Flippin. He served as Justice of the Peace for more than 50 years, preformed many marriage ceremonies, and often held court (for minor offenses). Raymond (Smokey) McVey was the agent for Missouri Pacific Railroad for many years. One of Flippin's earliest residents and one of its best known and most highly respected citizens Was E. B. 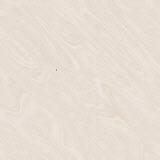 (Uncle Ebben) Wood. For many years he was actively engaged in farming and livestock production on the farm east of Highway 178 from Crane Creek on the north to the edge of town on the south, including the school grounds and to the cemetery road on the east. His home, at first, was near the present site of the Lester Wood and Erwin Wood residences. Later a part of the farm and home was sold to Mr. M. A. Mears and Mr. Wood moved to the home on Girard Street where he resided until his death in 1956. In addition Uncle Ebben carried on extensive farming operations on his farm on White River near Denton's Ferry. In his younger days he was a horse fancier and always kept one of the best saddle horses in the county. His love for good horses came in good stead when he was appointed by the U. S. Department of Agriculture to supervise the charging of the government dipping vats in North Central Arkanasas -- including Marion County and most, if not all, of Baxter, Stone and Searcy Counties. He rode the trails and roads alone on horseback at a time when cattle dipping was unpopular and the vats were frequently dynamited. Threats against his life were made but he went about his job, apparently undisturbed, and in time convinced most of the cattlemen that dipping their cattle meant better prices for them and that led to little opposition. Uncle Ebben never ran for public office in Marion County, but his advice on political affairs was highly desired and he was considered a political power in White River Township. "Uncle George" Billings was another familiar figure. He lived at Oakland before he came to Flippin and was a mail carrier. At Flippin he hauled the mail from the depot to the post office in a push cart so he was always around the depot at train time. He was awarded the Carnegie Medal and Reward for saving the life of a child (Virginia Hayes) when he grabbed her from a stalled car in the path of an oncoming train. He was injured making the daring rescue and walked with a limp the remainder of his life. G. G. Parrott and Sons operated a large grocery store in the 1940's and E. E. Noe opened a hardware store about the same time. The past thirty years have attracted furniture stores, clothing stores and shoe stores, along with various other businesses. There was, and is, a lot of real estate business since the area has been discovered. The hotel and meat market operated by Joe McCracken burned. Many early-day Flippin businesses suffered devastating fires because the bucket brigades did not afford much of a chance for saving the buildings. H. F. Wood and Paul Bonham were Flippin mayors in the early 1940's. V. M. Phillips, William Daffron, Albert Reed and others had served previously. Glenn Johnson was recorder in the early 1940's, sometimes acting as mayor. In 1946 Gus McCracken was elected mayor and was instrumental in getting the airport here. The U.S. Government wanted to put the landing field and weather station here but a percentage of the cost had to be contributed locally. Since the town had very few sources of revenue, it was raised by donations from concerned citizens with help from all over the county. H. M. Warner was Mayor part of those years and his main concern was keeping the peace and slowing traffic in the boom town, for the workers from all over the United States were helping to build the monstrous Bull Shoals Dam. There was not nearly enough housing so the people pitched tents, begged for a converted chicken house, or anything that could be made livable. Marion County had beer and whiskey but Baxter and Boone counties were dry; so the problems were many. At this time, Flippin had no water or sewer systems. About this time the veterans home from World War II banded together and formed the Clark-Padgett VFW Post, with which Mr. Warner was associated. J. W. Quearry became mayor in 1952 and his council was composed of Mary C. Grayham -- recorder and alderman; Lucian Wood, Jim Wilson, Lyle Wood, Joe Rorie and 0. B. McCracken. They authored many of the ordinances now on record. One of Mr. Quearry's main projects was getting the streets black-topped. Though he worked full-time, he found time to contact the people and explain his plan -- the city would pay one-half the cost if the owners in each block would pay the balance, which meant one-fourth each if there were residents on each side of the street. In the usual cooperative spirit, he soon had pledges for as much as the city could afford to match and soon the first black-topped streets appeared. It became more and more evident that a water system was a must. Mayor and councilmen explored every possibility of financing. They often made trips to Little Rock at their own expense but usually met with frustration and disappointment. In 1954 Mr. Quearry was re-elected; 0. B. McCracken, Lyle Wood and Joe Rorie did not seek the office as alderman so Owen Burris, Albert Reed and Karl Marshall were elected as alderman and Jean Marshall as recorder. Eforts were still being made to obtain a water system. Preliminary engineering had been done with an HHFA loan but those plans did not materialize. In 1955 the desire and need became a driving force. A small garment factory expressed a desire to locate here but because there was no water system or fire department they decided to go to Cotter. At a town meeting attended by many who realized how badly Flippin needed industry, many suggestions were offered. One offered by A. N. Wood, Attorney, was that the town form an improvment district and since the assessed evaluation of property in corporate limits would allow only a debt of $40,000 that area banks be asked to handle the loan instead of a bonding company. 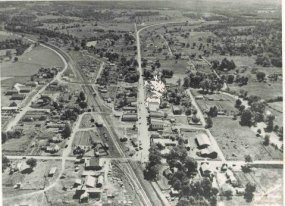 The Bank of Yellville, the People's Bank of Mountain Home, the Security Bank of Harrison, and the Commercial National Bank of Little Rock (trustees for the loan) loaned the city $10,000 each and, with $40,000 and a good credit, the system was begun. Ray Moore, local well driller, drilled the well for a small down payment and carried the balance with no interest charged. Council members heard of a used tank at Malvern, Arkansas, which could be bought. Away they went again. They bought the tank, had it cut down and moved to Flippin and reassembled. Those who said a water system could not be built with $40,000 working capital were almost right. The Council relied heavily on a good credit -- making payments for fire plugs, meters, pipe and supplies from water revenue and the people were paying a 5% assessment tax on their real estate. The loan, made for 20 years, was paid off in twelve years. Mr. Quearry was mayor until October 1956, when his work out of town caused him to resign. Jimmy McVey was appointed mayor in his place and Jimmy, with the council, worked at getting a fire truck and keeping the city business running smoothly. With the help of the Civic Club, donations and good management, a fire truck was obtained and a volunteer fire department was organized. R. D. Sanders was appointed alderman in 1956, Everett Rorie in 1957. Albert Reed was the first Water Department Superintendent and he began working for the grand salary of $20 per month plus $1.50 per hour for extra duties. Lynn Briggs was the first Fire Chief, serving from 1957 until 1965. In August 1957 the Council purchased the building which houses the fire station and city hall. This, too, was bought on credit and paid for in monthly payments. It was bought from Kenzie Baird with a down payment of $100. Paul Sowell and Virgil Dewey began serving as aldermen in January 1958. Guy Shaw began serving as alderman in 1960. The city's business was growing and the Council was busy trying to keep up streets, handle the water system and keep order. Mayor McVey resigned in June 1960 and Guy Shaw was appointed mayor with Noel Pangle taking his place as alderman. By the early 1960's it was becoming evident that a sewer system was a necessity. This, too, entailed a lot of work, setbacks and frustration. It took almost ten years to get it done. Everett Rorie was now working full-time as Water Superintendent. Others serving as Councilmen during those years were: George Hickey, Chester Parrott, Kenzie Baird and R. W. Johnston. Bob Marbery replaced Virgil Dewey when he resigned in 1964, and Tom Hudson took Chester Parrott's place when he moved out of the city limits. Bob Jones was an alderman until he moved out of the ward. The town became a city of the second class after a special census in 1965 put the population at more than 500. Natural gas became available and was a big help to the residents. Karl Marshall was not a candidate in 1966 and Joe Rorie joined the Council in 1967. This year the street signs were installed and more streets were blacktopped. The town was growing rapidly with new businesses, subdivisions and new industry. Lyle Wood was appointed to the Council in 1968 the main project was getting the sewer in and the actual work was begun in 1970. Joe Rorie resigned as alderman and worked as an inspector of the project. He was replaced by James Paul Flippin. In January 1971 Joe Rorie took office as mayor with a Council composed of: Jean Marshall, recorder, and aldermen Bob Jones, Hal Johnson, Virgil Dewey and Garld Short. Mayor Rorie died in June 1971; the recorder acted in the mayor's place until Hal Johnson was appointed to the mayor's position. He served until the next election. Virgil Dewey resigned in June 1971 and R. W. Johnston succeeded him. Arnold Berg became the Water Superintendent when Everett Rorie retired. In addition to maintaining the streets and water department, Arnold now assumed operation of the sewer plant. The Council sent him to school in Harrison where he obtained a license as sewer operator. The 1974 year began with Jim Reed, mayor; Jean Marshall, recorder; and aldermen of Hal Johnson, R. W. Johnston, Bill Baledge, and Garld Short. The special census in 1975 showed a population of 1026. Flippin now has an excellent telephone svstem, a prosperous bank, several new businesses, and expects to see many more improvements and growth in the area. Jim Reed resigned as mayor in April 1975 and was replaced by George Hickey, the present mayor.